Very cute photos! I love that your whisky shelf is right above your knitting book shelf. That is RIDICULOUSLY cute. Hubby and I are also big Futurama fans (really enjoyed the season of new episodes! 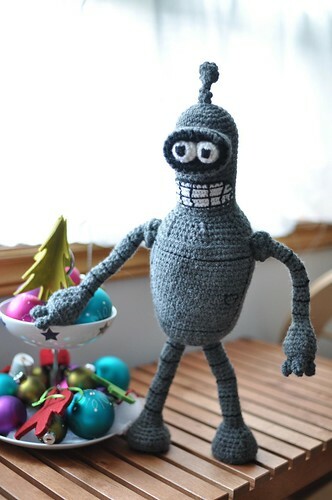 ), so I might have to learn to crochet just so I can make him a Bender. Hilariously cute! I love the way you can pose him. 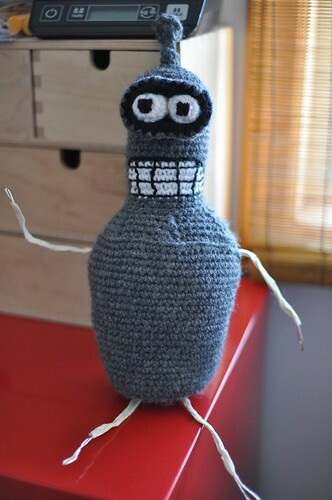 Everyone should have a crocheted action figure. I don’t even know what Futurama is, (sorry!) but I think you’re Bender is so adorable! I’m very impressed with the skeleton and how you can pose him. 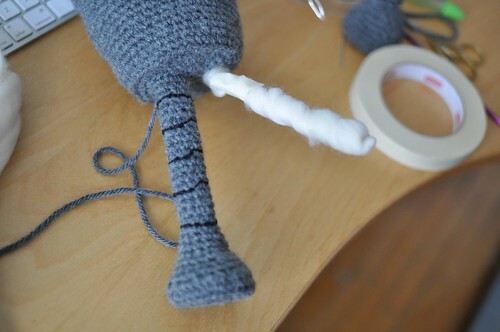 I love the action shots…knitting, getting into the whiskey, even his formal Christmas photo. So cute! I’m sure your boyfriend was thrilled. Wow, I don’t think I fully understood what you meant by super-size until I saw the picture of him on the bookcase. Very nice! I am impressed. that is freakinawesome, i want one. The whisky photo is the best evah, love the way the scale makes the miniature look like a litre bottle in Bender’s world! 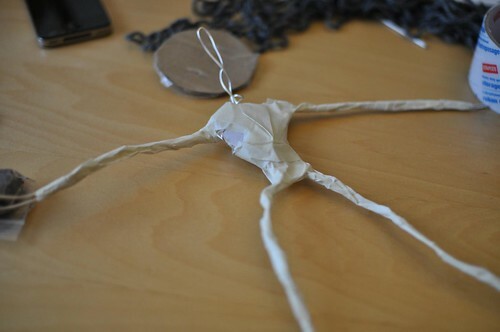 very interesting description of the wire skeleton too, i have kind of attempted a half-arsed version of this before using straightened paperclips, but beading wire and masking tape is a brilliant idea, thanks for sharing. I’m very impressed! 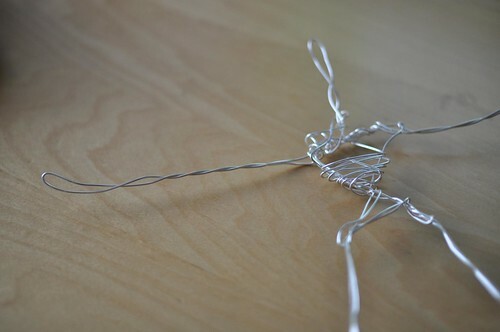 He is about the cutest thing ever…very clever of you to make a wire model. Awesome! 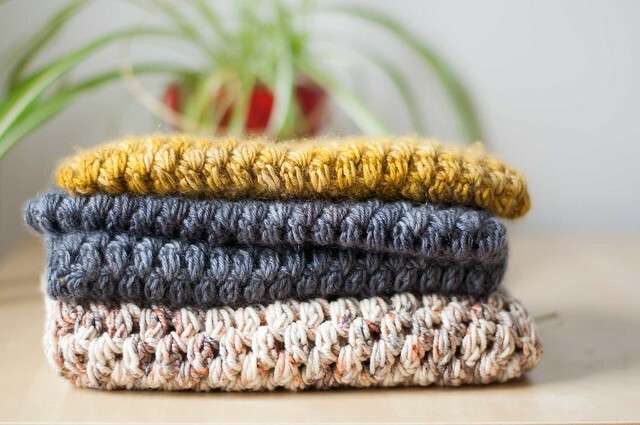 I’m tempted to learn enough crochet to make one for myself now. The wire body is a great addition and strong enough to make him stand up straight. Definitely going to have to remember this for later. I’ve been thinking about making myself a Bender for awhile now. But I’m sure all my beer would disappear if I left him at home alone. 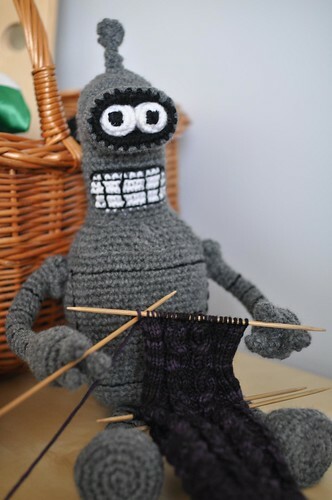 I love seeing how you pieced Bender together. Awesome!! What an amazing gift! Yay for a bendy Bender! AWESOME. I love it. 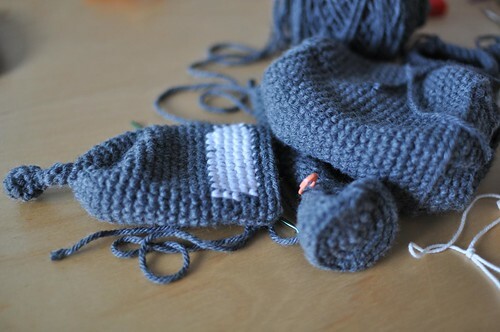 I have seen that pattern but am a hopeless crocheter :-) Way to go with all the details, and adding the wire frame! Smart. Dear jebus Laura, that is fabulous! Way to make Bender bend! I love it! A Bender that can bend and stand up–looks great! That, my friend, is amazeballs. 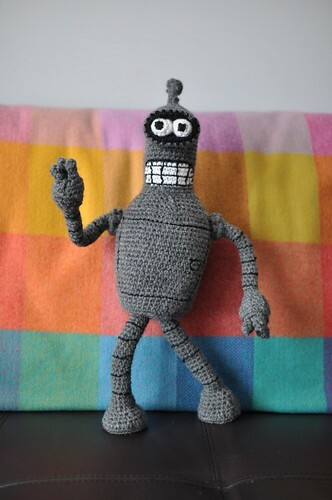 “Bender is great! Bender is great!” (At least, I think this is an actual Bender quote.) Seriously, your Bender is indeed great. Good job! I really like the photo of him on the booze shelf. Words cannot express how much I LOVE Bender. I must have Bender. 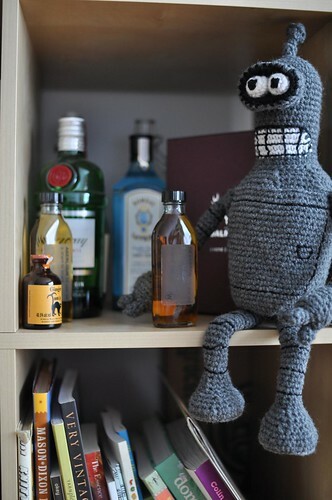 I chuckled when I saw this- naught bot getting into your whiskey! Love how he can bend… he’s 5% beading wire!